Of unknown parentage, but with all the characteristics of a williamsii hybrid. Small bright red, bell-shaped semi-double flowers, (on average about 8cm across). Upright, dense and rapid growth. Free flowering from January to March. A small bright red, bell shaped semi-double flower, average 8cm across. Upright, dense and rapid growth. Early to mid season flowering. 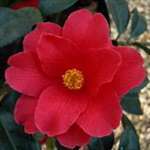 Bought this early flowering camellia to brighten up the garden in Jan/Feb. Shrub arrived in excellent condition with lots of beautiful bright red flowers and numerous unopened buds. Planted immediately and is now flowering profusely. Delighted with my purchase. Very friendly service. Responded with incredible alacrity to suggestion that there might be the slimmest possibility of getting the plant to us in time for a birthday. It arrived 3 or maybe even 2 days later. We were astounded and totally delighted. Exchanged friendly emails. They said they would do what they could to get it to us before the end of the week. It arrived on the Wednesday. Amazing. Highly recommend. Beautiful, healthy plant. Excellent plant, well packaged , prompt delivery.